Congratulations! You bought a new car, you spent a lot of money on it, and you want it to look like new as long as you can. 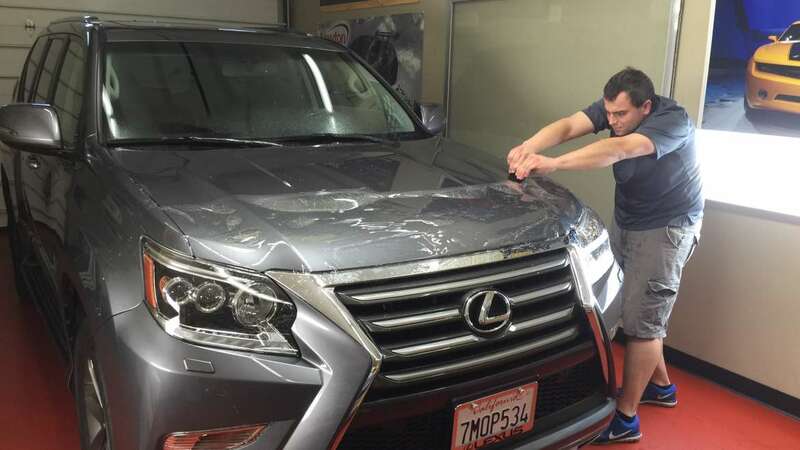 There are rocks, bird droppings, tree sap, people with cars and trucks that can damage your amazing new car, and so many other things that can damage your precious paint job! You want to drive your car like normal but you’re scared of damage that can happen so park your car at the very end of the parking lot where no one else parks. So, what do you do? The Solution: Paint Protection film aka “Clear Bra” will protect your car from all those terrible things you encounter daily when you actually drive your vehicle. What’s the point in buying your favorite car if you’re not going to use it? Clear bra is a clear, thick film that covers your paint provides a sacrificial shield between it and rock chips, deep scratches and stains that could reach into your clear coat. This will permanently protect your vehicle, so you don’t have to worry because the clear bra will protect you! We can remove and replace the film at any time without incurring any damage to your beautiful new factory OEM paint underneath! There is no better solution for preventing damage to your paint than 3M or XPEL Paint Protection Film. Clear Bra is most commonly applied to the front end of the car, which is where most paint damage occurs, but it can also be applied to other individual impact areas like trunk ledges, headlights, door sills, door edges, and rocker panels; which can all experience paint finish damage. Applications shown below indicate typical areas of placement on vehicle. Actual film placement will vary according to the needs of the end user. *Patterns not available for ALL Models and options. Please contact us for details. Call for a free, no-hassle quote! While we are a Preferred, Certified 3M Installer as well as an XPEL-Certified installer we also offer SunTek paint protection film. SunTek PPF also have outstanding qualities like a self-healing clear coat finishes, superior stain resistance and they are guaranteed not to yellow. All of our Clear Bra kits can be installed using either 3M or XPEL patterns customized to your vehicle for a perfect fit. *Limited liability warranty, non-transferable, see dealer for details.